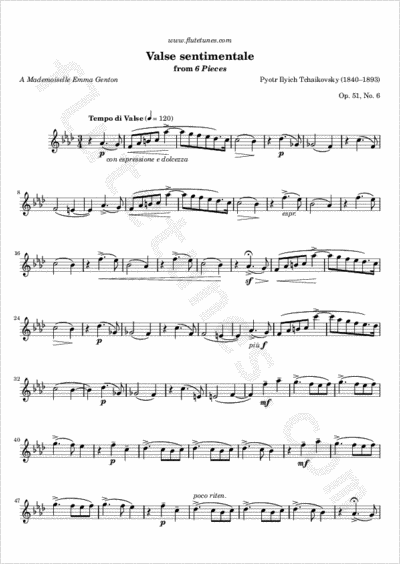 The “Sentimental Waltz” is the last of Tchaikovsky's Six Morceaux (Six Pieces), Op. 51. Originally composed for solo piano, this waltz has long been a popular salon piece. It has also often been played in its transcription for violin. This waltz was composed during a very difficult period in the composer's life. From the late 1870s until 1885, the composer felt restless, somewhat disoriented, and unsure of his creative powers. As a result, he led a nomadic existence, constantly traveling, without a home he could call his own. Composed in the summer of 1882 at a cottage where Tchaikovsky was able to work in peace, the Six morceaux are all dedicated to women. The “Valse sentimentale”, which is the best known work of the set, is dedicated to Emma Genton, the governess to the children of Nikolai Kondratyev and his wife Mariya, who were family friends of Tchaikovsky.